I will be traveling to Cange, Haiti in exactly 1 week! Haiti is located on the island of Hispaniola, between Cuba and Puerto Rico in the Caribbean. 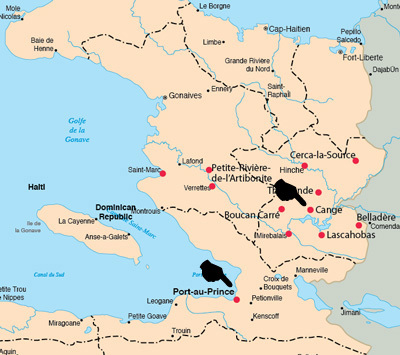 Haiti occupies one-third of the island; the rest belongs to the Dominican Republic. Cange is about 2 hours outside of Port au Prince. Cange is a small village located in the Central Plateau of the country. It's located by the Lake Péligre which was formed when the US Army built a hydroelectric dam on the Artibonite River in 1956. It's said to be a beautiful lake but much controversy surrounds it. Many Haitians were stripped of their farmland and homes by the flooding due to the dam and those on the other side of the dam live on very arid and desolate land with no power. Ironically is the reason the dam was built, to provide power. How and why am I going? 18 young adults were chosen by the Western North Carolina Conference of the United Methodist Church to travel to Cange, Haiti. During our trip, our primary goal is to educate Haitian children on the basics of photography and how to show their world through their eyes via photography. We are there to teach them a new skill. We will be working with 2 different schools. One in the town of Cange and another in a very rural setting outside of Cange. I've been working with another friend and photographer, Amber Herlocker, to create a curriculum to teach them photography basics. [Styles, camera anatomy, composition] We are putting this curriculum into a workbook that they will use and we will be leaving extras with them to continue to teach the skill! It's been a tiring, but fulfilling process creating this curriculum from scratch. It's reminded me of why I am so passionate about photography. To have this opportunity to show and teach how to view, capture and tell a story through the lens is thrilling! I'm excited for this new photography challenge for myself - teaching and documenting their story while visiting. I'm reading a book right now about Paul Farmer by Tracy Kidder. It's called Mountains beyond Mountains. It's AMAZING, Paul Farmer is amazing! I highly recommend this reading. Kidder is a Pulitzer Prize winner and he tells an amazing story. The trip is funded by a grant, so no fundraising was needed. We, as a team, are working to collect point and shoot cameras to let the children use during our time. We will then donate the cameras to the school when we leave. They have absolutely no means of obtaining prints of their work. I am bringing 2 small printers with me that only print 4x6s and this will allow us to leave them with a few tangible results of their work. Upon returning home, we will have prints made and shipped back to them. Please keep the team and myself lifted up in prayer. I ask it for safe travels, camaraderie of the team, my family being left - schools, schedules, routines being turned upside down. Hopefully much more to come on my trip! Since you noticed that I started a blog I thought I would check yours!!! I hope that your trip to Haiti is fantastic. I know you and Amber will make wonderful teachers. You are such a world traveler!